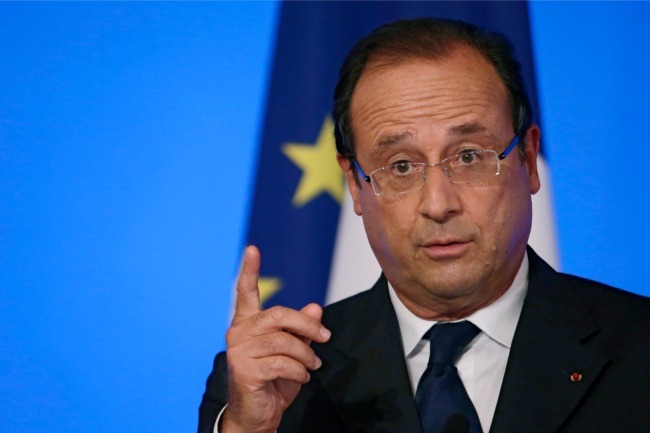 As the U.S. and Britain debate action, Hollande pushes for Syria strikes. PARIS -- Britain backs out, the U.S. dithers and delays, but France stands ready to strike Damascus imminently, even without a parliamentary vote. Assumptions about special relationships and Gallic exceptions in military affairs are being turned on their heads in the Syria crisis. And Paris’s seemingly newfound hawkishness is impressing and confounding France’s veteran critics in Washington and in London. The sarcasm has been dripping off the pages of British newspapers, which mock the French as Uncle Sam’s new poodle. Today Hollande took time out from a press conference with German President Joachim Gauck to repudiate Bashar al-Assad’s direct threats against French interests outlined in the dictator’s interview with the Le Figaro newspaper. The threats had only ‘‘reinforced France’s determination,” said Hollande in remarks that sounded positively Sarkozyesque. “The most serious threat would be to leave him (Assad) to his own devices, allow him to continue to use chemical weapons,” the French president added. Even if the U.S. decides not to strike Syria, France was ready to ‘‘take her responsibilities in supporting the Syrian opposition,” he said. For the moment at least, Paris is more united, determined and ready to ‘‘punish’’ Assad and send a message imminently than either Washington or London. For all the talk, however, French parliamentarians aren’t clamoring to vote on military intervention in Syria, and certainly not before the U.S. Congress does. Tomorrow’s scheduled National Assembly debate will go ahead without a ballot. Nonetheless, the option of a vote has not been ruled out by Hollande, who has revealed himself in less than 18 months as president to be a robust interventionist willing to take the lead in military affairs. January’s invasion of Mali was undertaken at France’s behest and with little material assistance from either its European allies or the U.S. After backing the Mali action, France’s Socialists are also on board with Hollande on Syria. Le chef de l'Etat has nothing remotely like the outright mutiny of dozens of Tory MPs that British Prime Minister David Cameron faced in last week’s lost vote in the House of Commons. Nor does he have a diverse and divided Congress such as President Obama faces. In fact, Hollande has a party secretary, Harlem Désir, who has accused the center-right opposition of having a ‘‘Munich spirit’,’ in reference to the failure of appeasement on the eve of World War II. Socialist voter and philosopher Bernard-Henri Levy wrote an impassioned oped in Le Monde refuting claims that strikes against Assad will aid Islamists. The author and activist has called on Obama and Hollande to put the Syrian question at the heart of discussion at the G20 meeting in Saint Petersburg -- and even adjourn the meeting if Vladimir Putin refuses to act against Syria. Even one of the French opposition leaders, Jean-François Copé, has ruled put pushing for a National Assembly vote on the grounds that it would compromise the president’s “absolute right” to intervene military without consulting the Assembly. Meanwhile, France has released its own intelligence confirming chemical weapons attacks by Assad. Hollande and the French military were geared up for an immediate military strike early this week until Obama tossed the Syria decision to Congress. The fact that France is more gung-ho on Syria partly exposes the inaccurate and unfair caricaturing of the French as overly isolationist by Americans and the British during the Iraq war. The truth is that because Jacques Chirac refused to join the invasion in the absence of firm proof of weapons of mass destruction, France was less traumatized by Iraq -- and it now feels freer to act on Syria. Emma-Kate Symons is a journalist based in Paris.